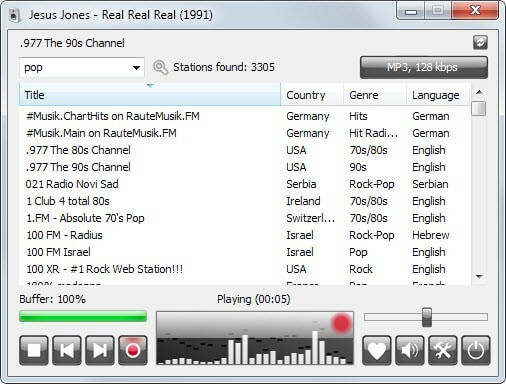 Most media players support Internet Radio, so that it is possible to play streams right in the player. All it takes is to find the right station, which usually happens either on websites such as Shoutcast or in the programs if they ship with a list of stations by default. When it comes to recording, Internet radio offers many advantages including the splitting of recordings in songs, the recording of multiple streams at the same time, and features to search and record songs of interest. 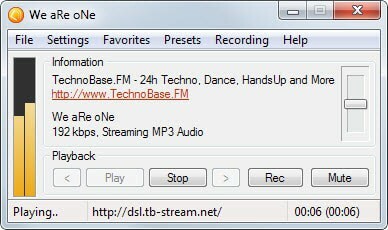 Internet radio is one of the few free legal options to increase a collection of digital music in a short period of time. If you can record 14 songs per stream per hour, and record 10 streams for an hour a day, then you end up with 140 songs after a single day, 980 songs after a week, and 3920 songs after a month. The programs listed below had to meet certain requirements outlined below. Programs that did not were not included in the list. Note: We have only included Internet radio recorders in the list and not audio recorders in general. You can use an audio recorder like Audacity to record Internet radio, but it is nowhere near as comfortable. A free version of the Internet radio recorder needs to be available. The recorder cannot limit the number of recordings. Below is the list of programs that met the requirements posted above. The list is sorted alphabetically and you find a table with information afterwards which you can use to compare programs with each other. A recommendation is added to the end that reveals the program or programs that we recommend. 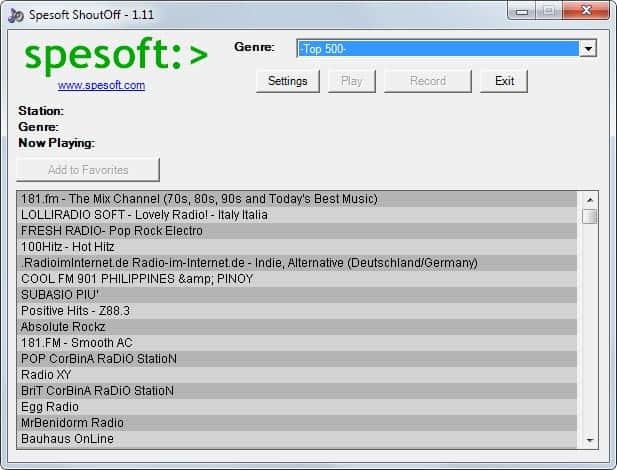 The free version of Radio Sure ships with over 17,000 stations according to the developer. While it is limited in some regards, it can record two stations simultaneously for instance, it is offering most features that one expects from a great Internet radio recording app including unlimited recordings, options to add new stations or support for favorites to access preferred stations quickly. To use it select one of the supported stations to play it in the interface. If you want to record, hit the red recording button to do so. The free version of RarmaRadio seems limited to recording a single station. It displays thousands of stations sorted by genre, network or region in its interface that you can browse and search. You can also add your own stations to the program or use the search if that is what you prefer. Once you have selected a station it starts to play automatically. You need to hit the record button to start the recording. Here you have options to to record the stream for as long as you like, to record for a certain time period, or to only record a single song. RarmaRadio supports quite a few additional options including scheduled recordings of specific stations, a wishlist feature to record songs on it automatically if they are played, and even an option to rip audio CDs. Screamer Radio limits playback and recording to one station. While that is the case, it is offering several useful features to make the process more comfortable. This includes options to create a group of favorites for easy access, support for custom stations, and options to only record a song currently playing. The interface itself is easy to work with. You start by selecting a radio station from the presets menu, sorted by genre there, and will notice that it starts playing automatically once you do. All that is left is to hit the rec button to start the recording. This free program ships with hundreds of radio stations that you can select one from for playback and recording. The program's limitations are unfortunate, especially since there are no options to play and record different stations, or search for specific songs you are interested in. The recorder supports saving streams as mp3 or ogg files on the other hand which some users may like. When it comes to Internet Radio recorders, this is the application to use. You can record as many stations as your computer and Internet connection is capable of simultaneously which can be a lot. To do so, simple select stations using the browser attached to the right of the program window, or the title search feature which you can use to find specific songs you are interested in. Even better is the program's wishlist feature which lets you add songs that you want recorded to it. If streamWriter notices that a song on your wishlist is being played, it will start to record it automatically for you. There is also an ignore list which does the opposite of that. Recordings can be scheduled which can be interesting if you like a particular show and want to make sure that you record it every time you cannot listen to it. The program takes care of ads automatically for you, supports track splitting with silence detection, and post-processing. While all recorders allow you to record radio stations, it is streamWriter that excels in this. It not only supports the recording of as many stations as you like, but offers a massive amount of features to make the process even better. Besides scheduled recordings, it is the whishlist that is a great addition. Just add songs you want recorded but cannot find to the list and the program will take care of the rest. While the chance is higher if a song is popular, you will be surprised how fast wishlist songs are found and recorded even if they are not overly popular. 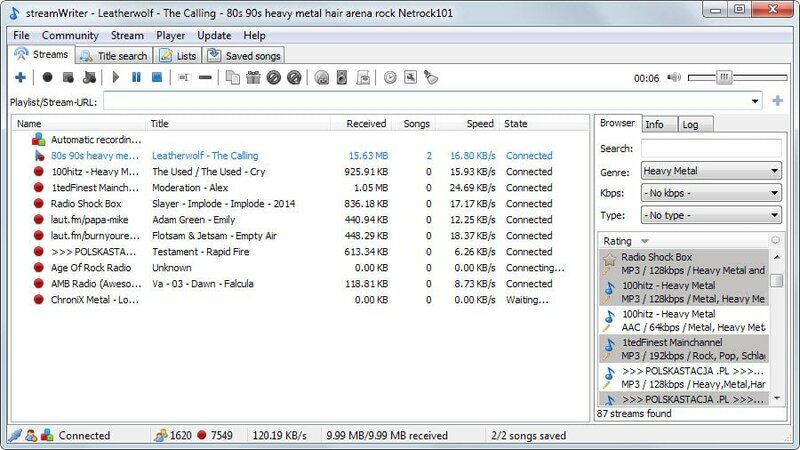 : Are you using a different program to record Internet radio? Or a different method? Feel free to share it in the comment section below. A best of Internet radio recorders listing that reviews the top free programs for Windows. The guide offers a comparison table and recommendations in the end. 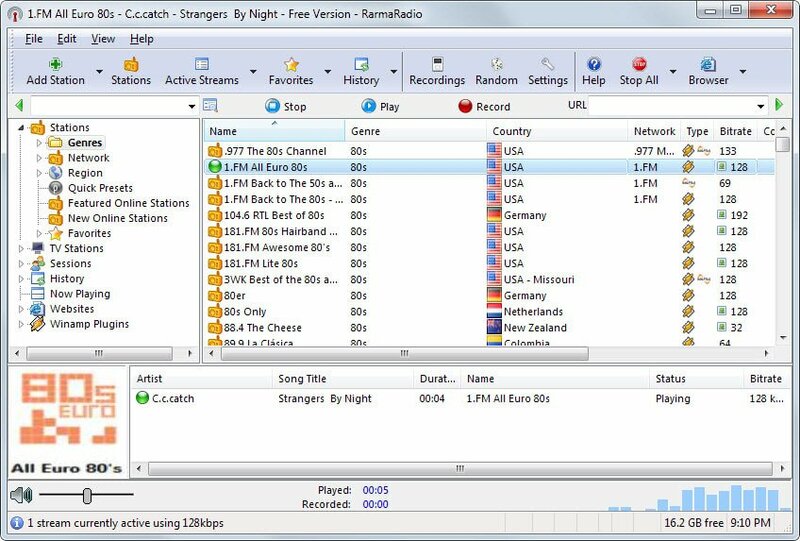 I used to use streamripper back in 2001-2002, and again around 2011-2012, which was a program for shoutcast streams and worked great. Not perfect, but great. It’s because of that program I have stuff I ripped from digitally imported and blue mars/cryosleep. The Digitally imported playlist reminds me of college, and Blue Mars is now gone, but at least I have memories of it. I used to use Screamer Radio, but now use RadioSure. I find that the search for stations is clunky, no option to filter for English only for example. If a station changes it’s streaming URL, I just add the station in with a slightly different name and new URL. Wow, Screamer Radio. I forgot about this. I use to listen to Rush Radio for hours. Try this one Martin Tapinradio. Tapin is by the same maker of Rarma Radio I believe. Not sure about the differences. Is there anyway to record music played through Amazon’s Prime music subscription, ie http://www.primemusic.com? Where can I get smooth Bloomberg US? I use RarmaRadio, it’s quite good (offers junks during installation) but it differs from the TV. Does Streamwriter come in english? Yes it does, but also in German, Russian and Spanish. streamripper… You had to start it before Winamp… I let it run on weekends: it made me conscious of a hogged PC. These post is near and dear to my heart. Thank you so much. Would you know of any internet radio recorders that you’d recommend for Android? I’ll give it go, thanks! radio.de ist not a recorder, though a nice Online Radio portal. ClickGaGa (http://clickgaga.ga) What make it stand out from the rest, is its recording time shift capability and its flexible timers system for playing and recording. With the PreRecording (time shift) feature you can start recording a song while listening to it. It will record from the beginning even though you click record after the song has started. Free radio recorder with some unique features. Prerecording (time shift) technology enables recording a clip from its beginning, even if you hit the “record” button after the clip has already started. With the timers system, you will never miss a program, the timers can be set programs to automatically turn on or record hourly, daily, weekly or monthly. Clickgaga includes three timers each timer enables start, stop, recording, change of stations and volume change according to a preset schedule. I been using WR recorder for years I know its clunky GUI wise and not free but I need to schedule hourly and 30 minute chucks of the live stream from my local radio station WGOW 102.3fm, they just changed from FLV type stream to mp3/wmv ,WM recorder is having a heck of a time with it the last week. I do hourly and 30 minute chucks to ensure if the recorded stops I have a backup, might not need it as badly with a newer program but sheesh nothing I have tried yet dose day format by custom name, mon/tue/wes/thr/fri, hour/minute format, uhg.